Let’s face it… we all run out of space here and there. 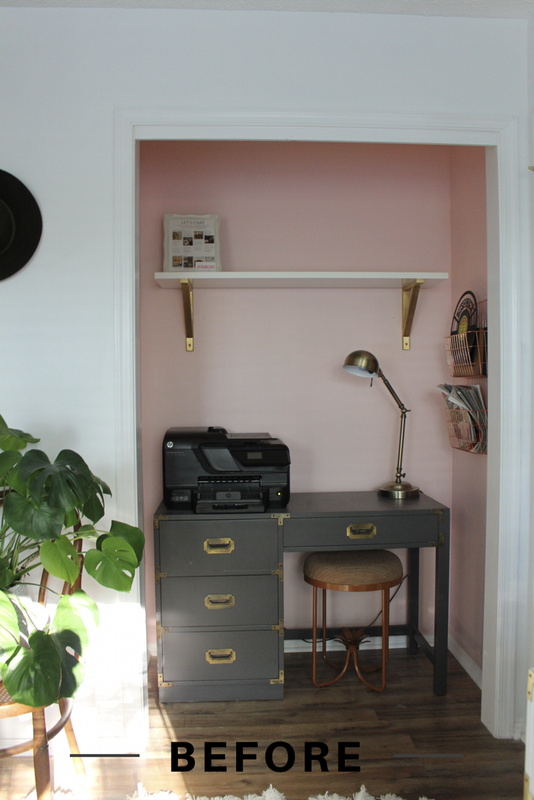 It’s especially easy to run out of room in a closet style work space. 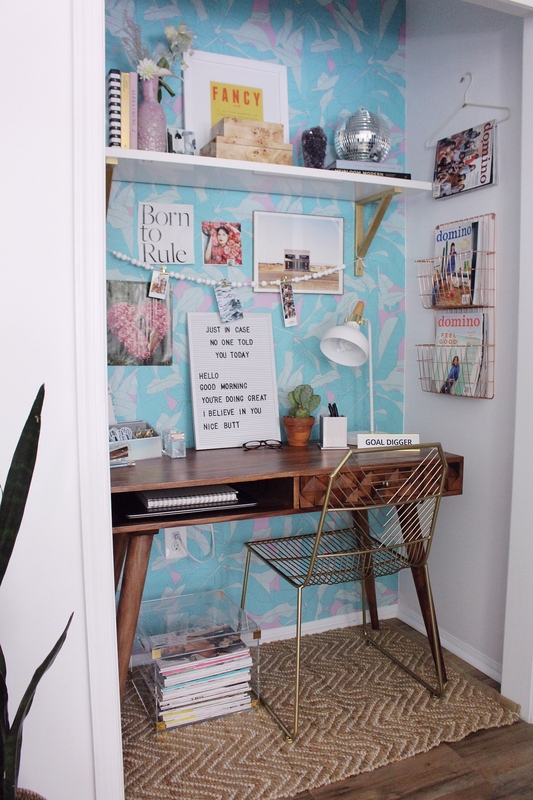 The closet may not be an ideal amount of room for an office area but you can get more use out of it then you think. 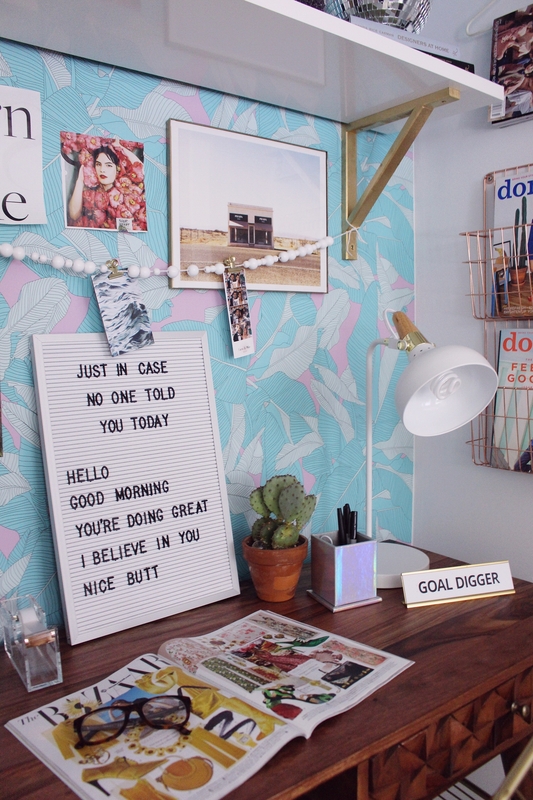 It can also be just as if not more inspiring than a regular office. 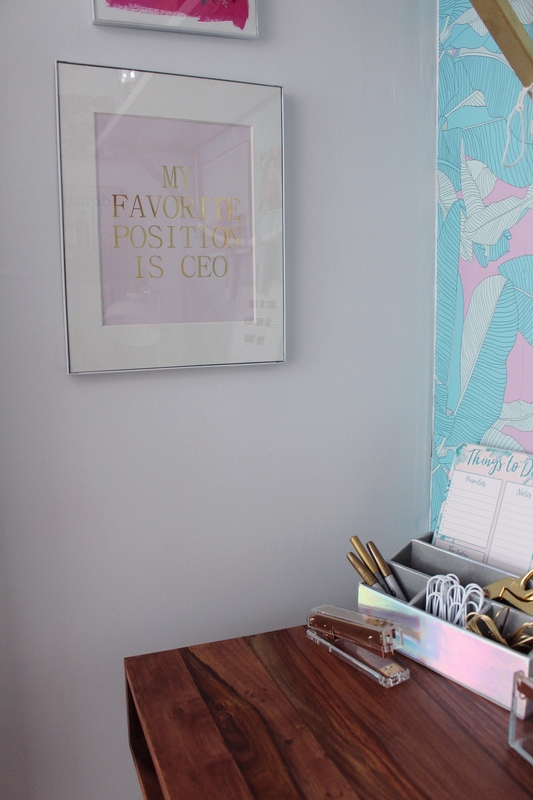 Here are some tips for getting the most out of your closet office or any office space. 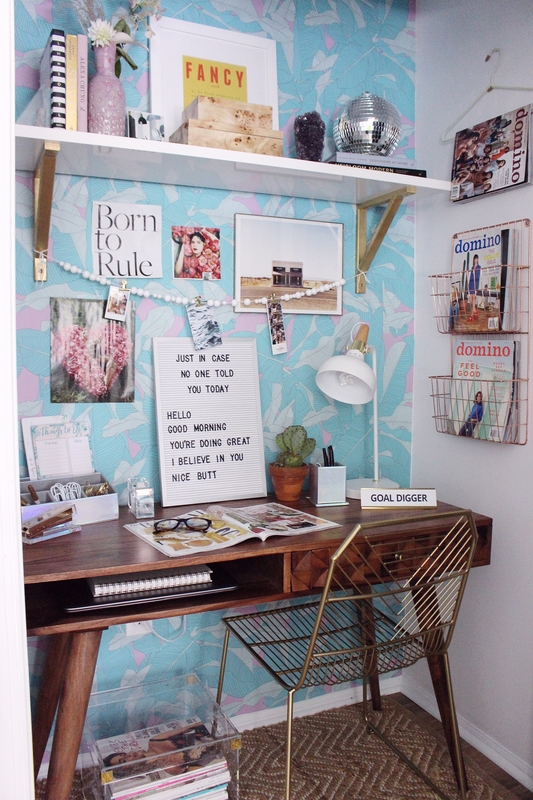 Just because your space is small it doesn’t mean it has to lack inspiration or functionality. 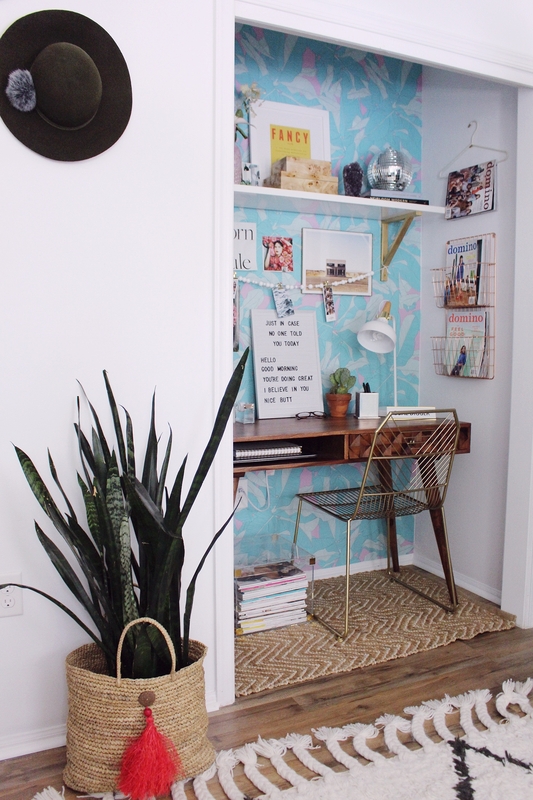 Sometimes your small space can have even more character. 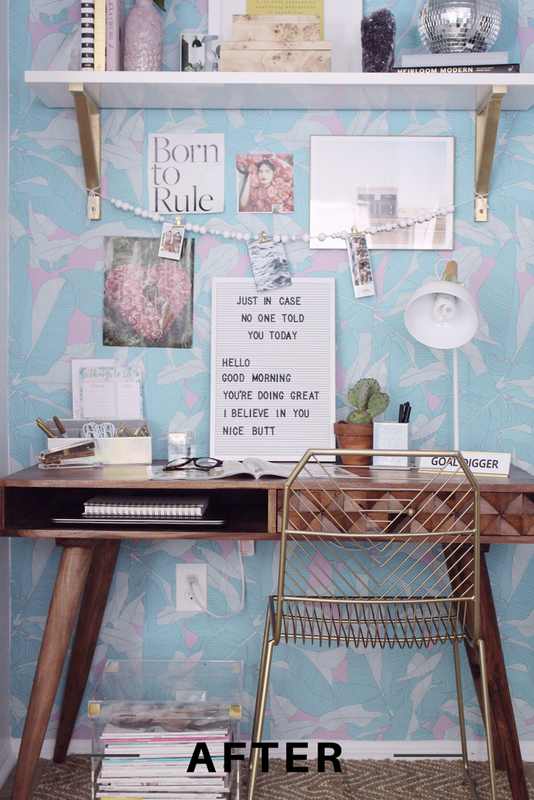 Below are some tips and visuals to help you get your best possible office space going. 1. Use a desk that you can fit things underneath. Use the room underneath your desk for a small cabinet, baskets, boxes or any other type of storage. I used to have a desk with drawers but all that got me was as big mess and less leg room. 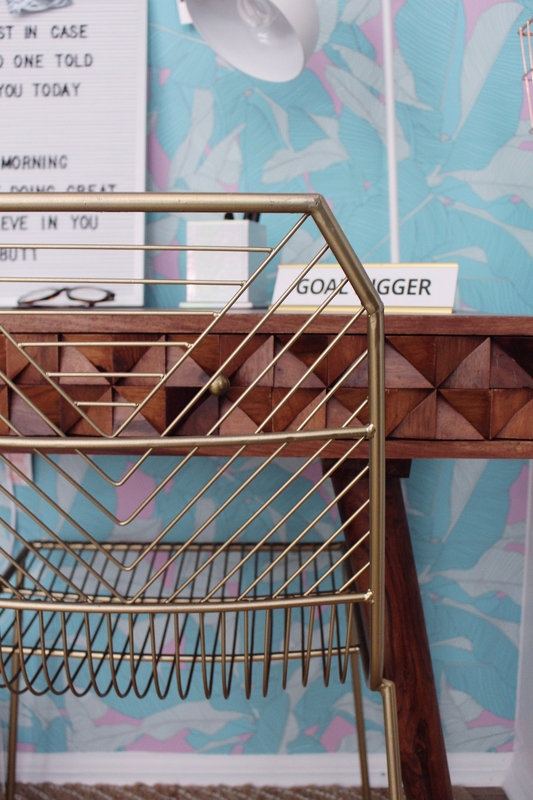 I found this wood desk at Home Goods and instantly fell in love. I love it because I can fit items underneath and having more leg room is more comfortable for long hours. 2. 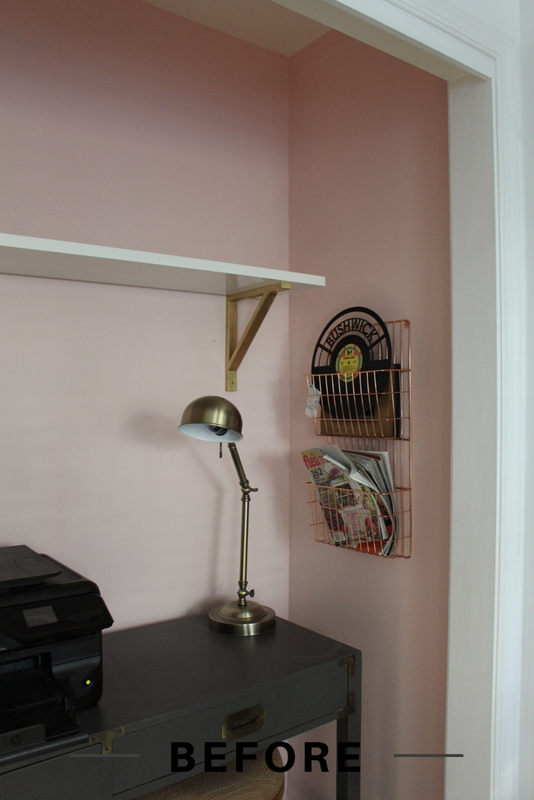 Since only a certain height will be visible to the eye in a closet office, hang shelves higher for even MORE storage. I have one main shelf in my office space. If you need more storage you can hang multiple shelves. 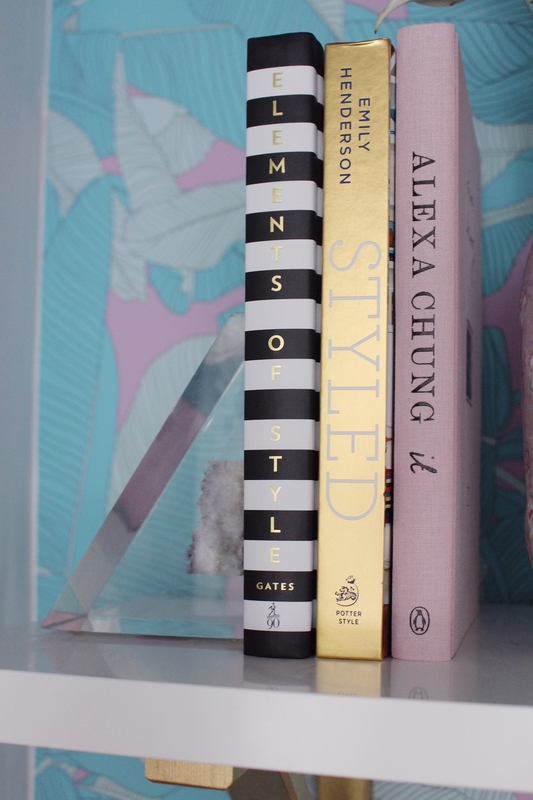 If you haven’t noticed already, Home Goods has great options for shelves. 3. 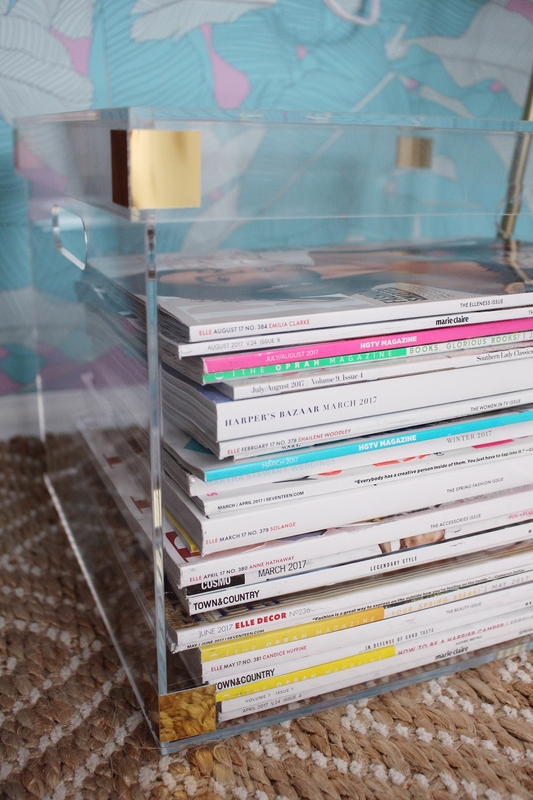 You can also add magazine racks to the walls for more organization and storage. It another fun way to add texture, color, and easy access to inspiration. 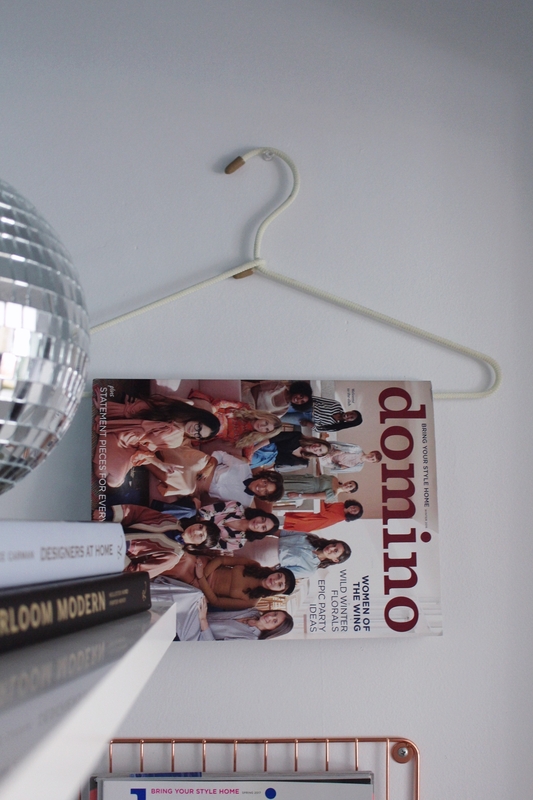 You can keep paperwork or inspirational magazines… or BOTH! 4. Don’t have any favorite art to hang? 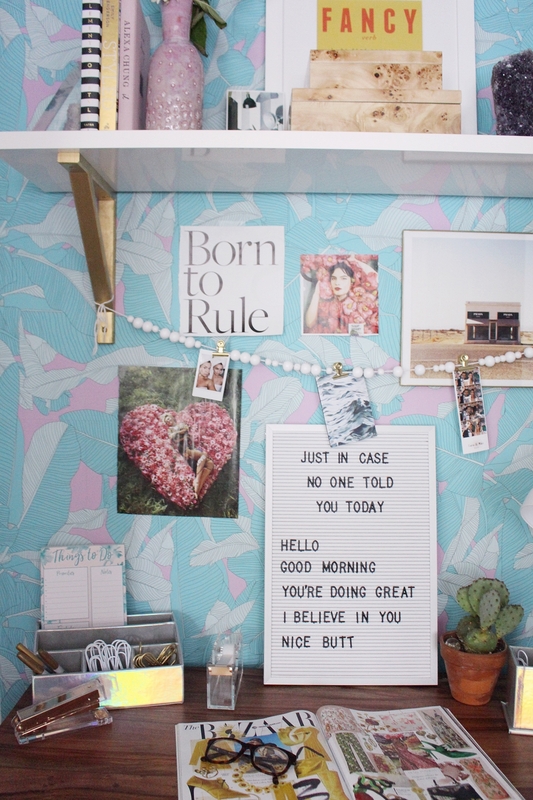 You can use magazine clippings from your favorite magazines to sass up your walls. 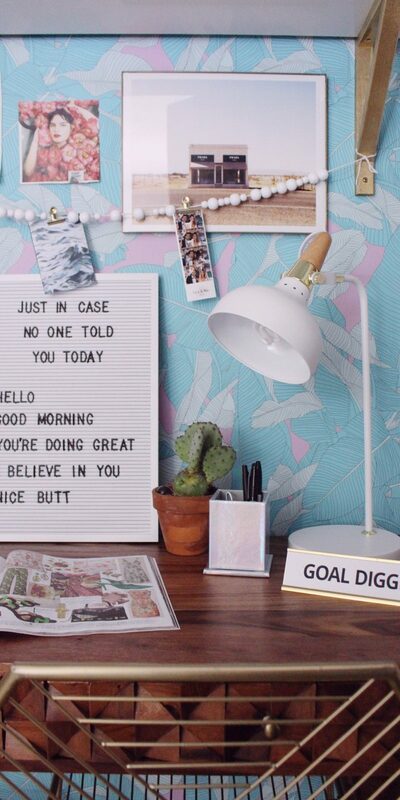 Another tip: Leave some room for a peg board, dry erase, or letter board. There are a ton of options for that at your local Home Goods store. 5. 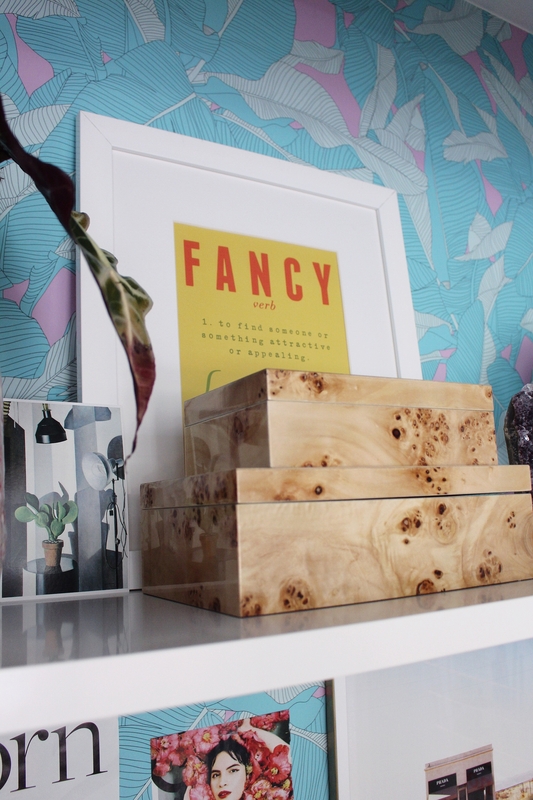 You can use everyday objects for hanging you items an art. Don’t worry about breaking out the hammer and nails. 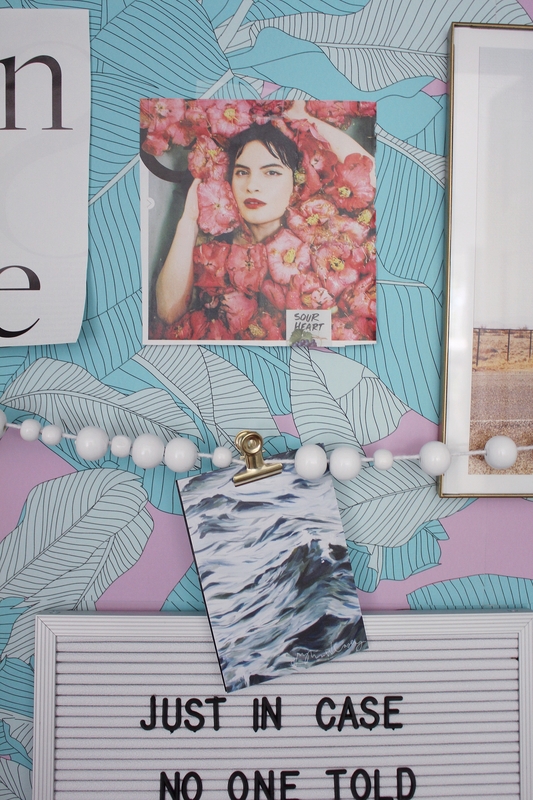 Below I used clothes hangers, binder clips, tape and push pins to hang every piece of art. 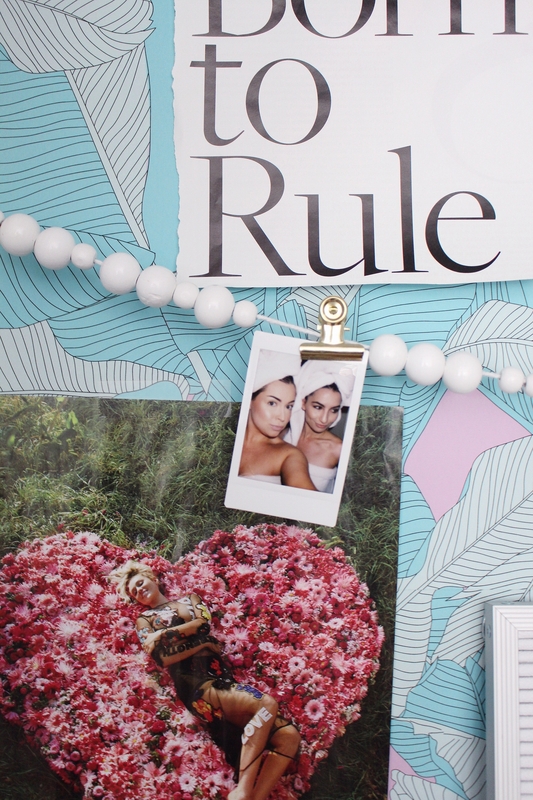 You can also use pom pom and tassel garland that can double to hang pictures from. You can find really fun garlands around the holidays at Home Goods! You can save money by getting creative with everyday items you already have. After use of clothes hanger to hang magazine on wall. 6. 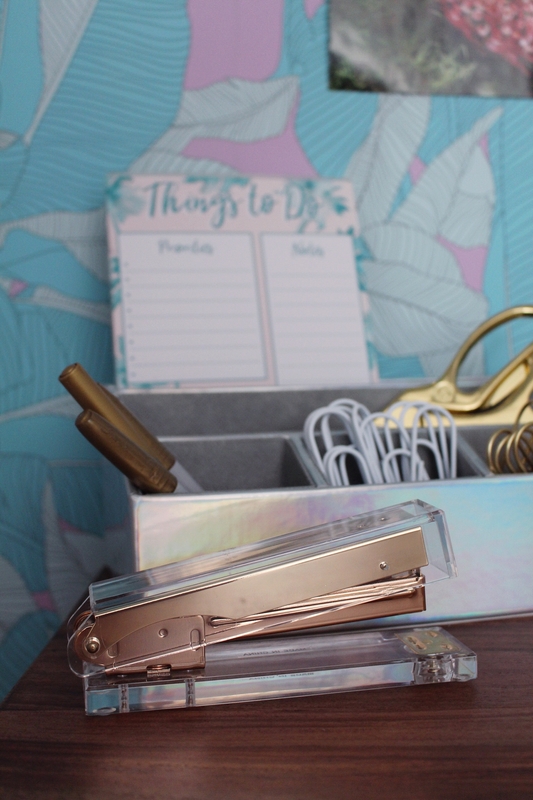 Another option for making smaller work areas appear less cluttered is to use acrylic accessories. Below, you can see that I used an acrylic tape dispenser and acrylic stapler. 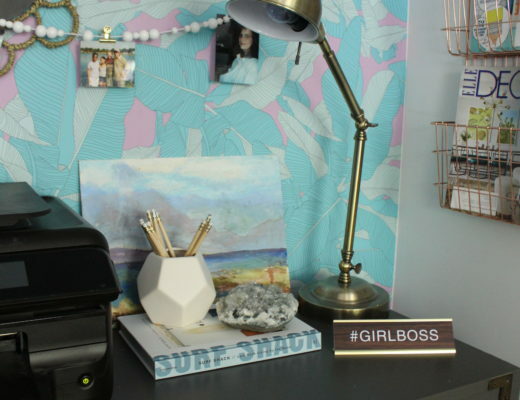 It helps keep a smaller desk look less cluttered. I also was SO excited to find an acrylic box for under the desk. Let’s talk about buyers regret for a second, or should I say the lack of buying. I was in my local Home Goods and I happened to walk by THREE different size acrylic boxes… and kept walking. I obviously went home and was SO sad I did not buy them. I went back the next day and only the large one was still there. My advice to you: just buy it, return later. 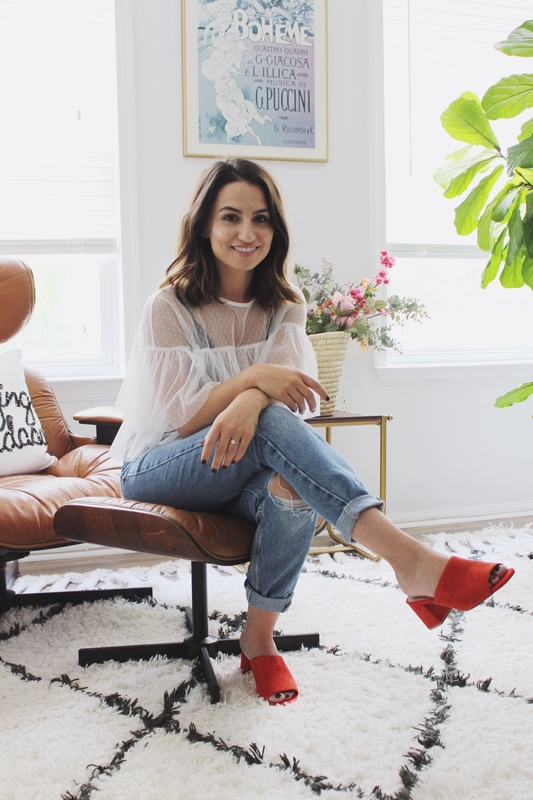 “Nothing haunts us like the things we didn’t buy” <– future sign hanging in Home Goods please? 7. 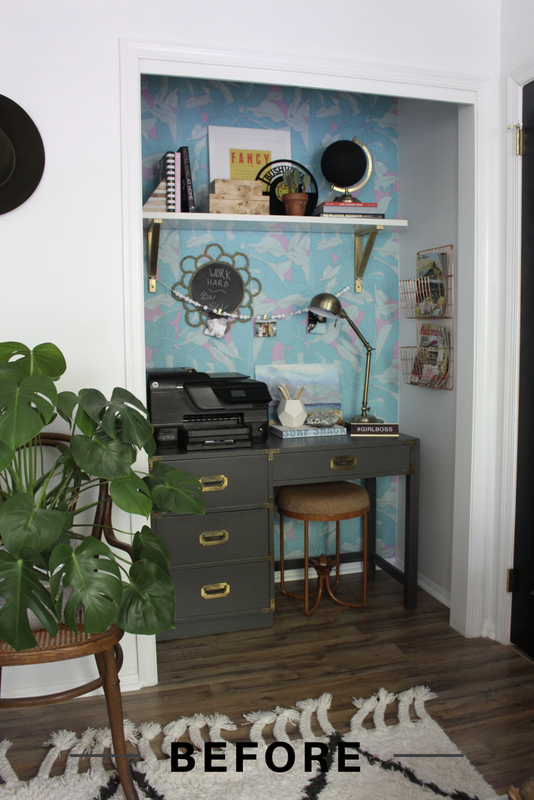 Last tip for adding a ton of character to a small closet office is bold wallpaper! 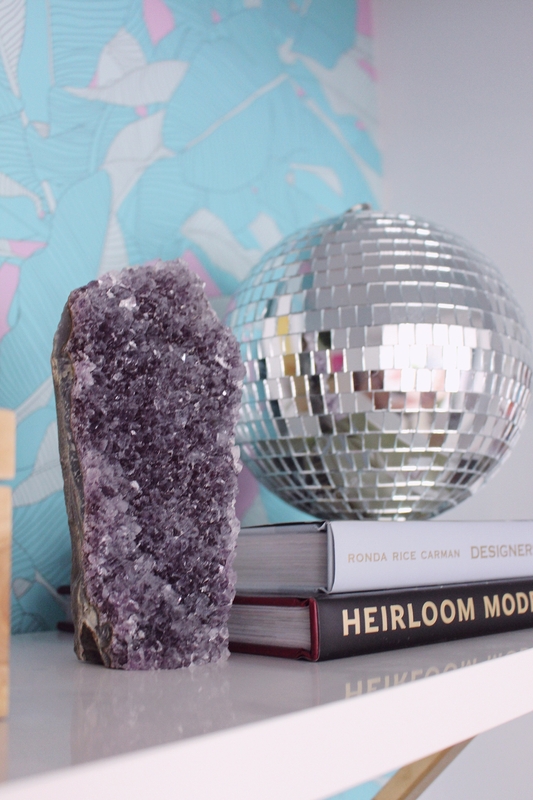 Pick something that all of your awesome Home Goods finds will pop off of! 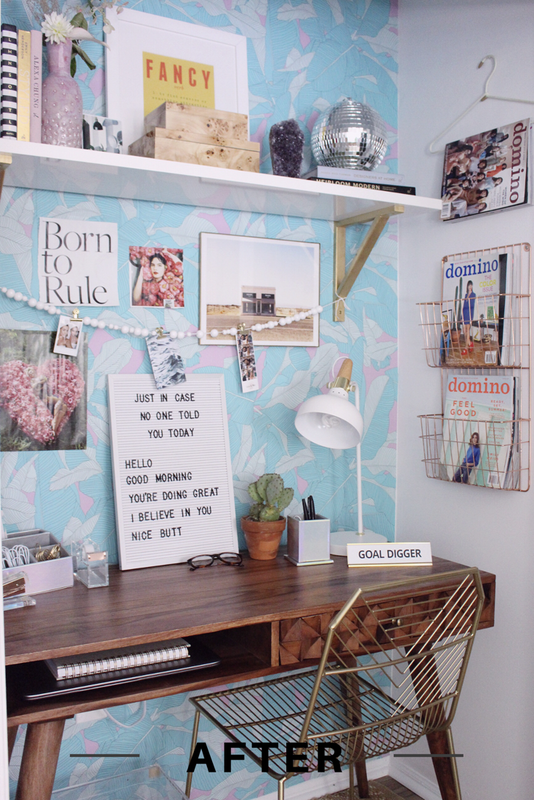 I hope everyone is super inspired to go make your small spaces and closets into your own inspiring office space! — especially just in time for Back To School! Check your local Home Goods every week for new and amazing office decor. 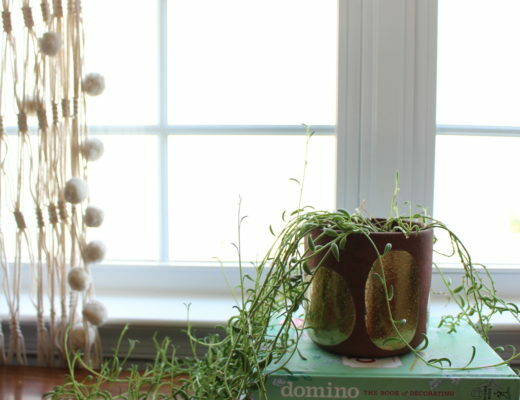 The household item you can use as fertilizer to save your plants. 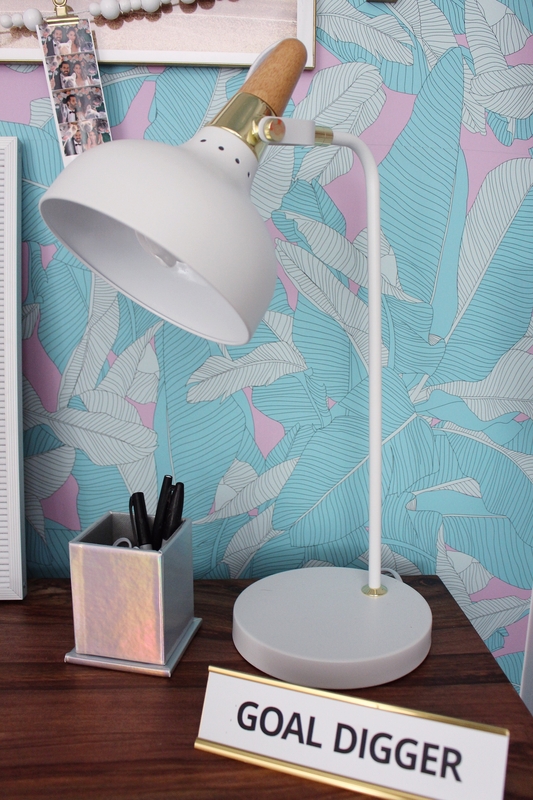 Hi, I am in love with the wall paper you used! The space looks incredible! Do you know what it’s called and where it’s from? Wow… stunning transformation! The assortment of storage and hangers is really cleverly done. Loving the garland! That was smart using a desk with more floor space. 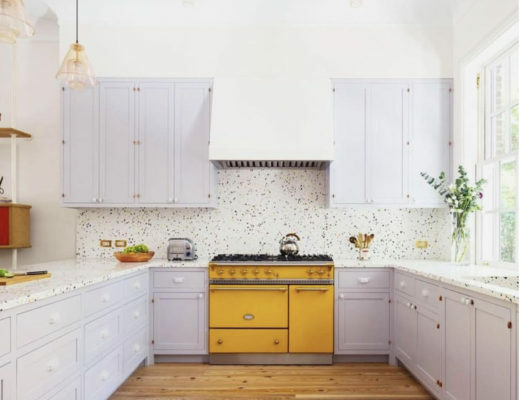 I think drawers would be the assumed choice in a small space, but it makes so much sense to avoid them. Great post!